Under the patronage of his excellency the president yasser arafat and the presence of the PEA Chairman,a corner stone has been Lay down for building the first power plant in Gaza vally at the Sea site. The Palestinian energy scientific center (PESC) is a governmental institutional that was established in June 1998 within the quarters of PEA . Nuclear Energy and Radiation protection Department was established in the PEA .It’s a governmental Competent authority responsible for policy and legislation . The PEA signed agreement with the UNDP to implement the project which is financed by the global Environment Facilities (GEF) .It's duration is 3 years .the project is part of a term growth of green house Gas emission from electric power Fuel resources. Nowadays The PEA tries its hard efforts to establish Sceintific library related to Energy -water- environment -economic-and part of tradition and Culture of people .Its aim providing information and data to all employees of the PEA and GED co .and PESC which Cousists of a group of universities and researchers . Eng. Hussein EL-Nabih from PEA planning department had shared in the above training program in Sweden; the program was organized by Swedpower International AB. PEA has participated through a working paper for power generation conference which held in Tunisia from 16-18 november1999 funded by European Community and Tunisia government. Palestinian representatives ,Dr.Omar Ketana PEA Director general and Ghaleb elshanti manager of generation department in the PEA. PEA has organised a sceintific seminar in the pea main centre under a head line future of energy in palestine ,several working papers were delivered in the scintific seminar for pea departments. “ The energy Future in Case of declaration Palestinian Independent State"
A seminar was held by an invitation from the national guideness Commission about the energy future in Palestine that hosted Dr. Abdel Rahman Hamad Minister of housing and the PEA Chairman . Dr. Hamad mentioned the measurments and the steps that PEA has taken in orde to ensure energy to the Palestinian and also the Construction of Power plant in Gaza . Through the Seminar , Dr. Hamad replied about many Question of the Audience . Establishing Women department in the PEA. PEA has established a Woman department that Concerned with women issues in the PEA and its role in the Soceity that a meets the PEA target in and out . 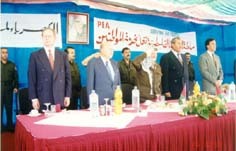 Under the patronage of his excellency president Yasser Arafat , PNA has signed a memorandum with USA government on the 22.Feb .2000. The a greement was signed by PEA Chairman Dr. Abdel Rahman Hamad and on the other hand Mr. Bill Richardson Minister of energy in USA with the presence of Dr. Nabil Sha’th Minister of Mopic and Dr. Sa’ab Arikat Minister of Local government and Mr. John Herbest the American general Consoul in Jerusalem . Dr. Hamad Confirmes that the memorendum main goal is to set the basis of Cooperation between the two sides that has the positive impact for the development of palestinian power sector . Under the patronage of the PEA Chairman Dr. Abdel Rahman Hamad and with the presence of representatives of European Commission and experts from Europe and Palestine . Workshop was held in Ramallah under a headline instituational infrastructure for the three major Compononts of energy in Palestine on behalf of Dr. Hamad, Dr. Omer Kettanah the director general of the PEA stressed that transmission Sector will be Subjected to the PNA Control for being regarded to the interConnection with Arab neighboured states like Jordan and Egypt and he explained that this meeting came as a set of projects, European Community has discussed with the mideterrenean Countries to choose the most important issue to study and Palestine has selected the infrastructure of instituation of energy - generation -transmission - distribution . PEA has dispatched of 20 trainees of engines and trainees to the kingdom of Jordan in order to make a training course in Jordanian electric company with regard to power substation, maintenance systems and high voltage networks. This program funded by the Japanese government.